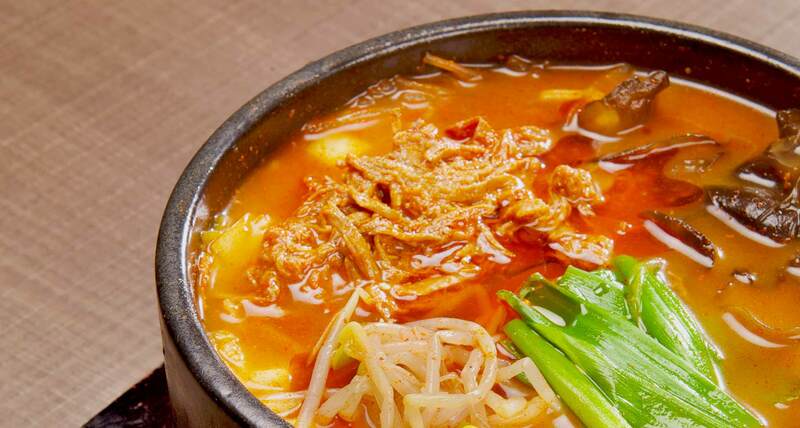 Yukgae-jang is a Korean style hearty, spicy beef soup made with shredded beef, lots of scallions and other vegetables such as Gosari (Korean fernbrake fiddleheads), beansprouts, and mushrooms. This is specially a great dish for this season when the temperature has dropped below 10. You won’t need anything other than a bowl of freshly cooked steamed rice for a completely satisfying meal. Because Yukgae-jang is a thicker stew-like soup, jam-packed with beef and vegetables; its rich flavour helps with blocked noses, while the high liquid content helps rehydrate while recovering from a cold (or heavy night out!). Now, you can visit SURA Korean Cuisine Restaurant for this great deliciousness! Click HERE to view Yukgae-jang on our awesome menu!